Reopened Nov 19, 2013 as an Alamo Drafthouse Cinema. The local TV news had a story this theater is shceduled to close in January. The operators of this theatre, Rave Motion Pictures, have purchased (or are late in the process of purchasing) the last two Showcase Cinemas locations in Michigan from National Amusements. That would give them theatres in Ypsilanti and Flint as well as Kalamazoo. Their web site is www. ravemotionpictures. com. RMP CITYPLACE 14 TO OPEN IN KALAMAZOO, MI ON NOV. 17 THE ULTIMATE STADIUM THEATER TO OPEN IN Kalamazoo on November 17, 2006 Dallas, TX. -Rave Motion Pictures’ state of the art 14-screen stadium theater with a new digital projection system opens in Kalamazoo on Friday, November 17. Rave Motion Pictures’ Cityplace 14 is located Downtown at the intersection of South and Portage streets. Rave Motion Pictures’ exacting standards create unobstructed viewing utilizing 18-inch risers. There is a remarkable 48 inches between rows for maximum legroom and ease of motion. Every auditorium has the finest in digital surround sound equipment, as well as a new digital projection system, as well as 3D capability on selected features. The 70,000 sq. ft.
theater boasts 14 auditoriums ranging in size from 465 seats to 105 seats, for a total of 2900 seats. Rave features luxurious rocker seats with retractable cup holder armrests for convenience and/or cuddling. Rave features wall-to-wall screens in every auditorium, and the easily accessible handicapped seating is designated in prime viewing areas. In fact, larger auditoriums have elevator access. There are two concession stand areas, a customer service window and a party room. Rave Motion Pictures’ Cityplace 14 opens just in time to usher in a spectacular Holiday blockbuster season, beginning with the highly anticipated release of the new James Bond thriller Casino Royale. The whole family can enjoy the animated feature Happy Feet, also opening on November 17. Then the hits continue through the end of the year with Eragon, Night at the Museum, Dreamgirls and much more. The Rave Cityplace 14, Kalamazoo staff is trained to provide top-notch service to complement your luxurious movie going experience. Multiple concession stands are strategically located for better service. We love to host birthdays, corporate, collegiate and private events. Convenient free-validated parking will be available for our patrons. The theater will have 24 hour ticket kiosks and internet ticketing at www. ravemotionpictures. com. We look forward to being part of a vibrant Downtown and the overall dynamic Kalamazoo and Western Michigan communities. In addition, we are excited to offer our state of the art facility, to the many college students near our Ultimate Stadium Theater. Founded in 1999 by Tom Stephenson, Rave Motion Pictures is a Dallas, TX based company, dedicated to enriching the movie-going experience through unrivaled technology and old-fashioned customer service. 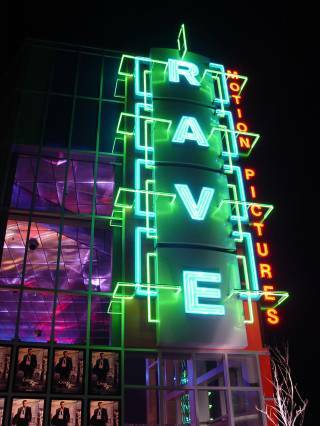 With 26 theaters in 10 states, Rave is excited to be a top entertainment destination and through ongoing efforts, a good neighbor and corporate citizen.